Move-In Ready 4 bedroom home with plenty to offer. Located in the back of the subdivision for peace and quite. This home has been upgraded in recent years including a new ROOF (2014), New A/C with heat pump in (2013). Both bathrooms have been redone with upgraded vanities. Also, solid wood custom kitchen cabinets with sliding shelfs for the cook in the family. It has a 2 car garage with a newer opener and remotes. All appliances are included! Wait there's more! Covered screened patio with heated Spa and firepit overlooks the fenced backyard! You can relax in total privacy and enjoy family time in the summer or winter! All the landscaping is well maintained with the help of a full irrigation system running off a newer well pump. A shed in the back holds all the supplies and tools for easy access and additional storage. When you arrive at the property you will notice the excellent condition of the exterior with a full gutter system. Low taxes and no HOA make this a very attractive and affordable opportunity for first-time buyers or if your downsizing. Truly a Move-In ready property waiting for you to call it home. 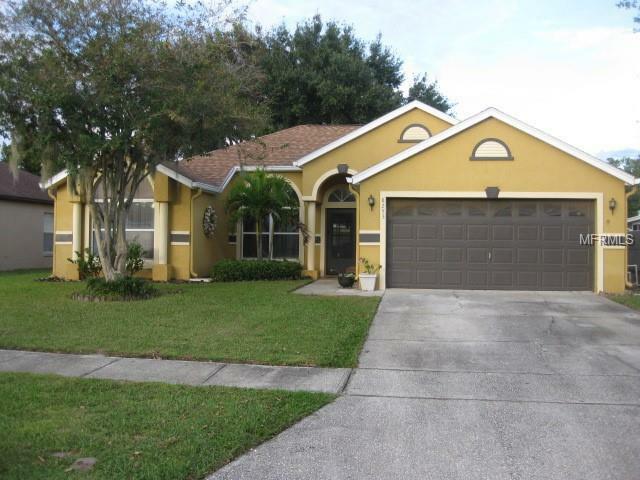 Listing provided courtesy of Florida My Home Re Ser. Llc.